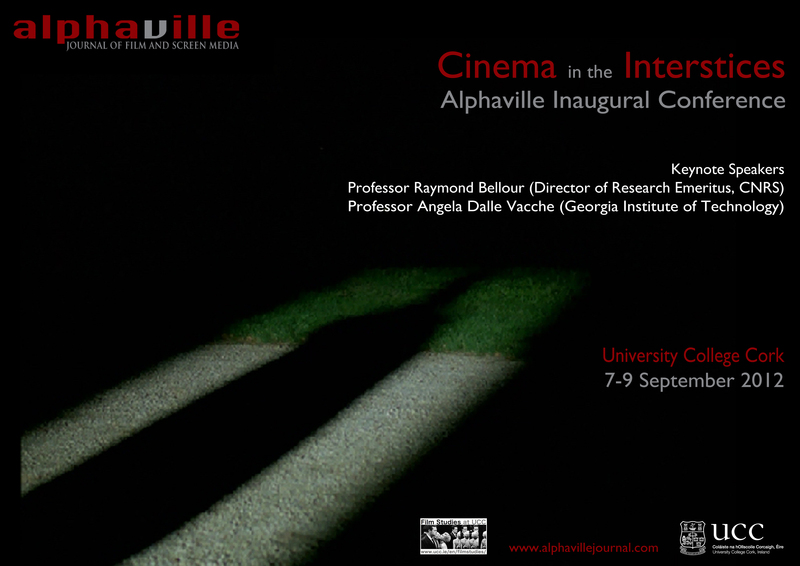 The Alphaville Inaugural Conference took place over three days from 7–9 September 2012, taking as its theme “Cinema in the Interstices”. Our esteemed keynote speakers were Raymond Bellour (Director of Research Emeritus, CNRS) and Prof Angela Dalle Vacche (Georgia Institute of Technology). Issue 5 of Alphaville stemmed from the conference and was edited by three of its organisers and members of the Alphaville Editorial Board, Abigail Keating, Deborah Mellamphy and Jill Murphy. The Alphaville Inaugural Conference was generously supported by Film and Screen Media at University College Cork, the College of Arts, Celtic Studies and Social Sciences at University College Cork, Meet in Ireland and Fáilte Ireland.